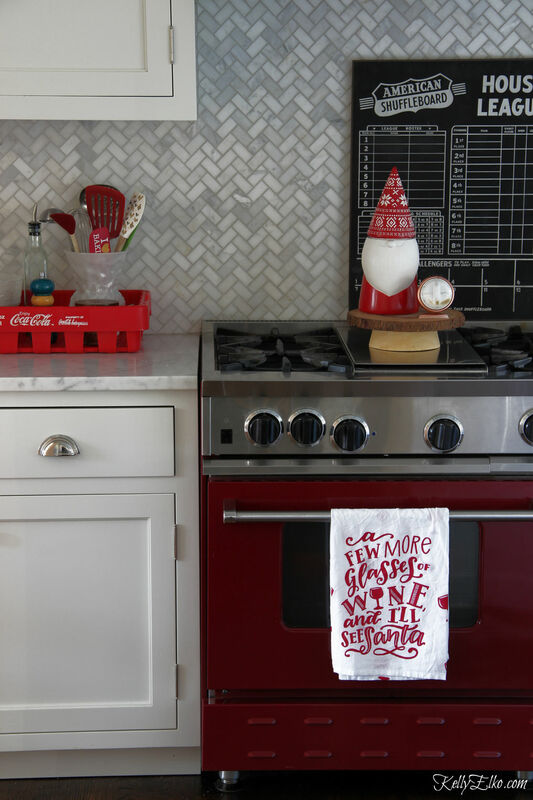 The kitchen is the heart of the home, especially around the holidays, so it’s fun to add a few festive touches since we spend so much of our time here. 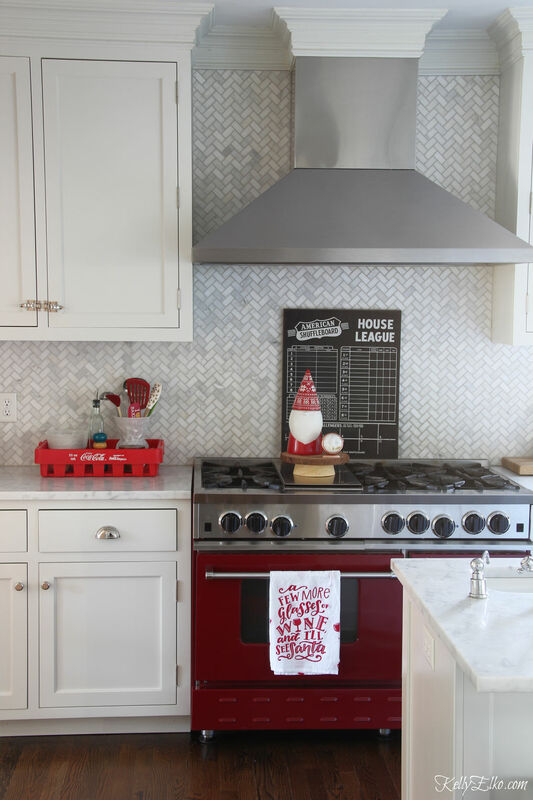 My collection of vintage soda bottles led me to my color scheme this year so welcome to my red teal Christmas kitchen. 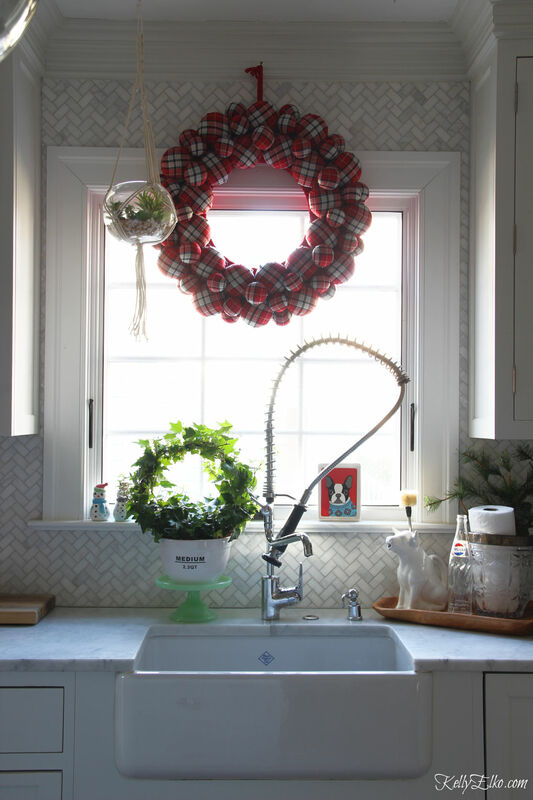 It’s a little bit vintage, a little bit new and a whole lot of festive! 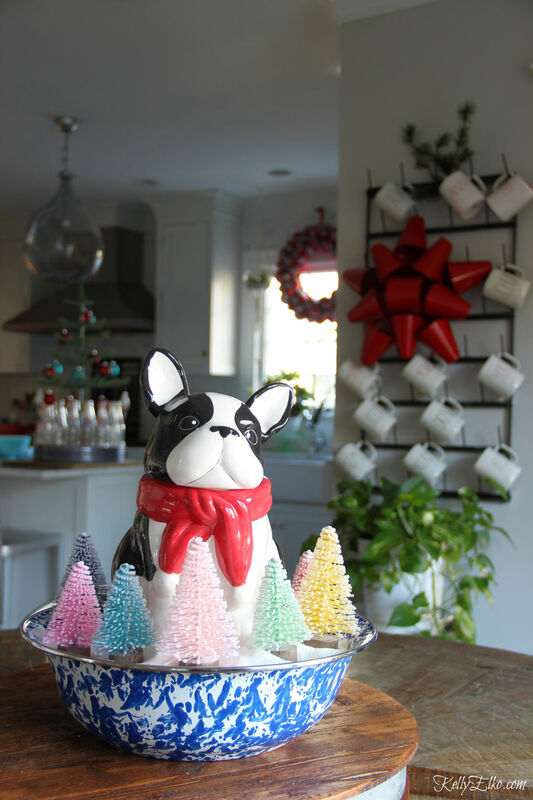 I don’t go crazy decorating the kitchen because who wants to move 800 things to wipe down counters … not me! 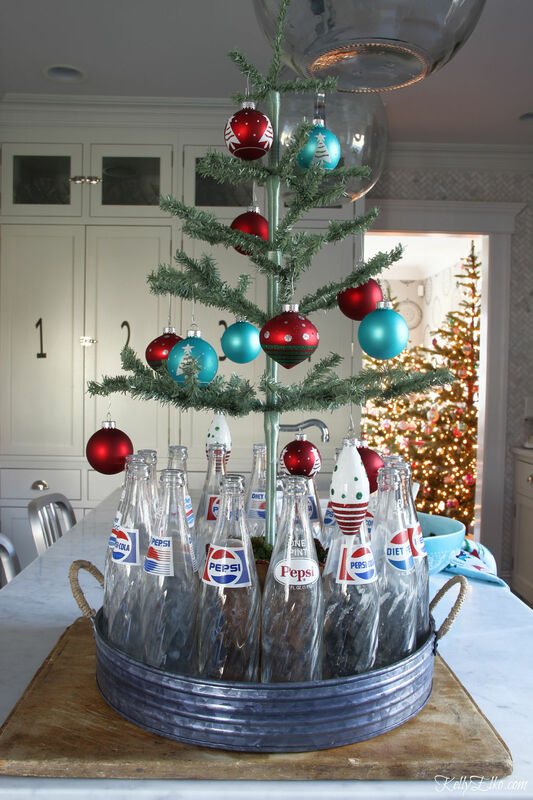 This is the perfect example of how I love mixing old and new … vintage Pepsi bottles are the “tree skirt” to my feather tree. I love changing out my huge bottle drying rack displays and I thought it was funny when more than one person told me that my big metal bow looks like red solo cups! Game of beer pong anyone?! 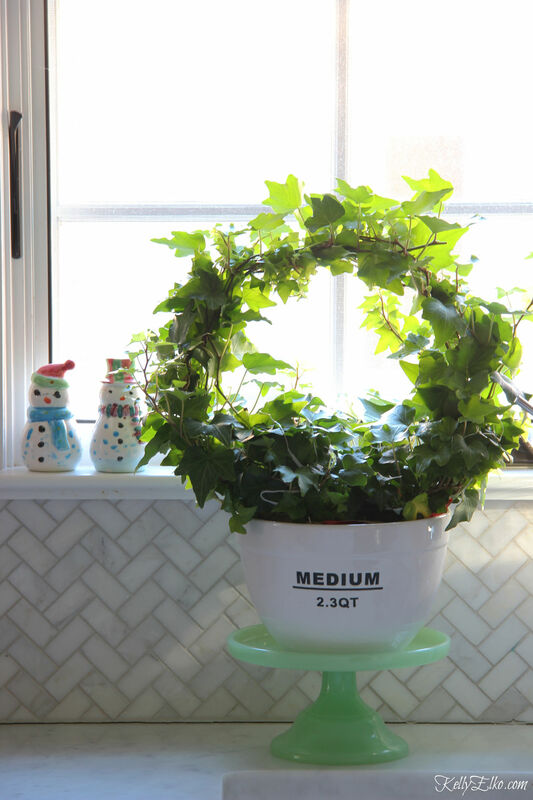 Take your plants to the next level by finding a cute bowl to hide the ugly paper wrap they come in. Here is a peek into my Shiny Brite dining room which you can see more of HERE. I want to stress that nobody should be stressing about trying to make perfect Pinterest worthy meals. 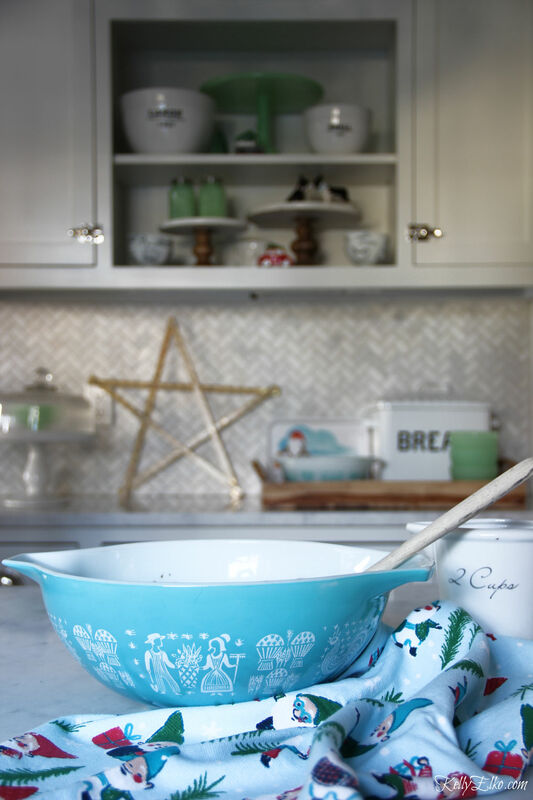 Did you know that if you make boxed brownie mix in a vintage Pyrex bowl, it tastes homemade! Not really but my girls like them and that’s all that matters. 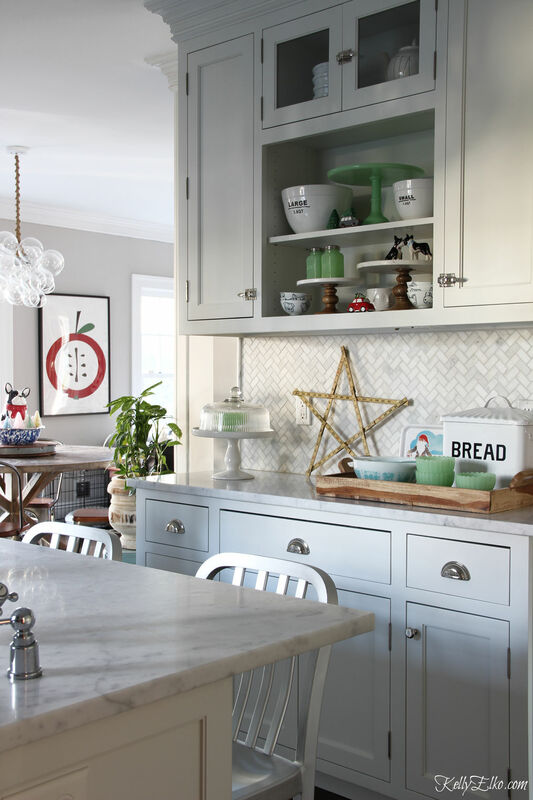 So while I may not win any baking awards, I can feel good about creating a warm and welcoming home where we enjoy hanging out in the kitchen together. 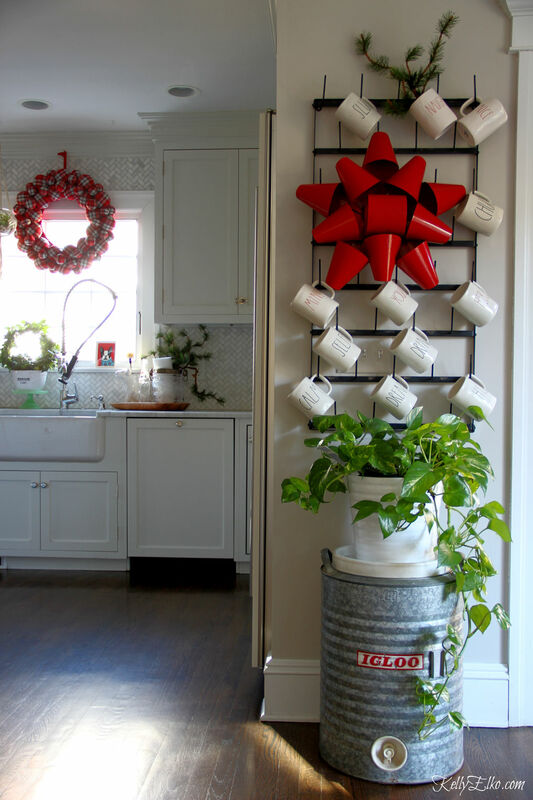 Use your everyday items in your holiday displays instead of wasting money on Christmas specific things. As you can see on my open shelves, I only added a couple of Christmas salt and pepper shakers to add a little pop of merriment. P.S. If you are in the boxed brownie making camp like me, sprinkle a little powdered sugar on top and everyone will think they are homemade! Love it all Kelly! I love all of your cake stands and your backsplash. I like that the cake stand on your counter has a lid. 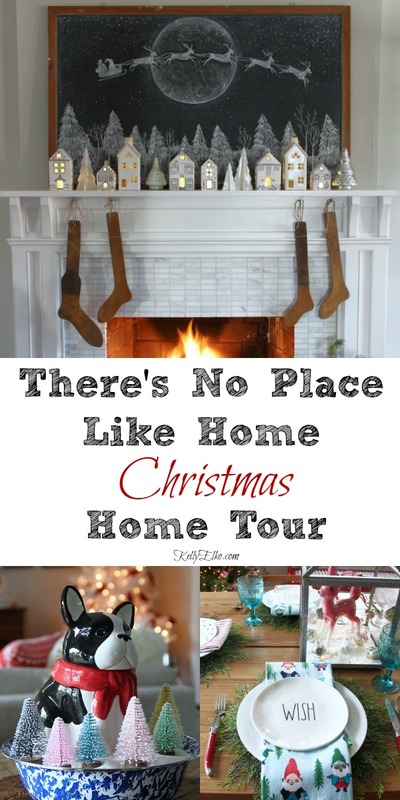 Your home always looks so clean and welcoming-I’m on my way over! ? I’ll save you a brownie! 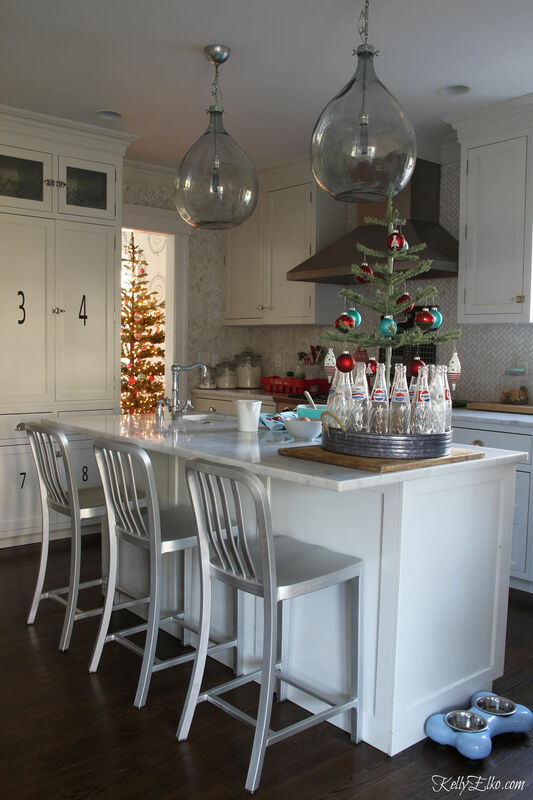 I love the ideas of adding pop bottles to your Christmas decor! 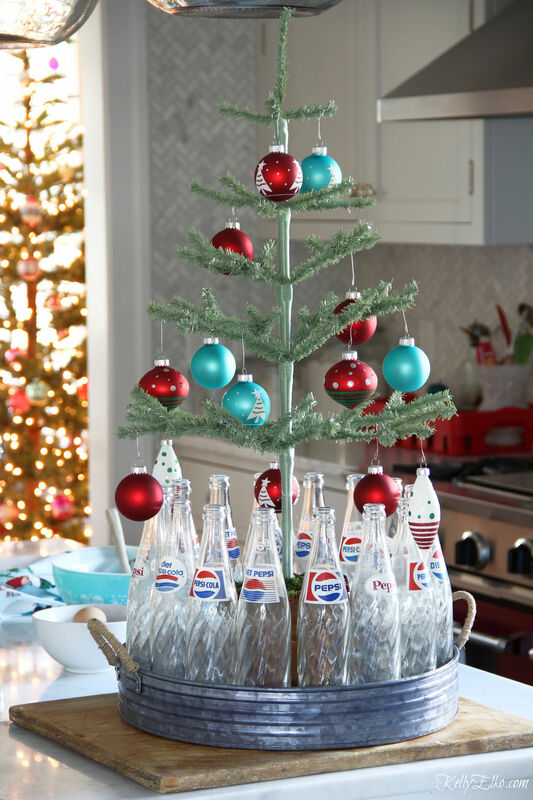 Think I’m going to go grab my cute little Pop Shoppe bottles and crate…Great ideas! I want to see what you do Lora! 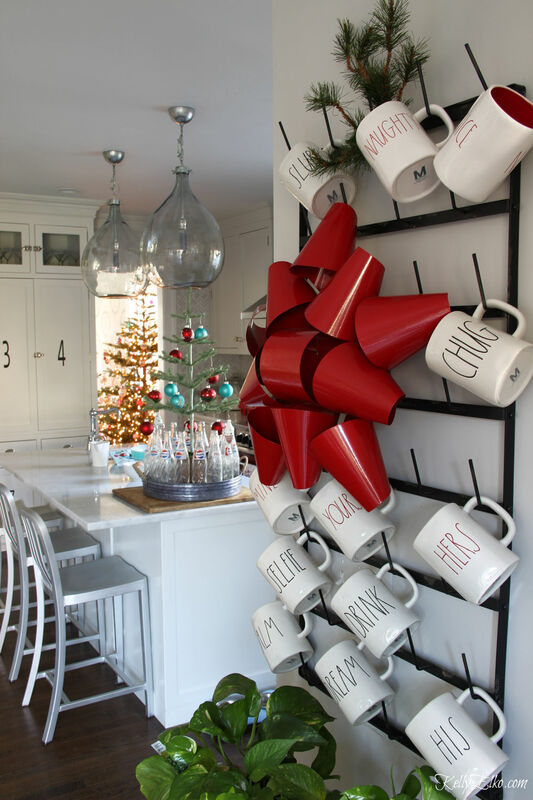 So cute and that bow does totally look like solo cups. 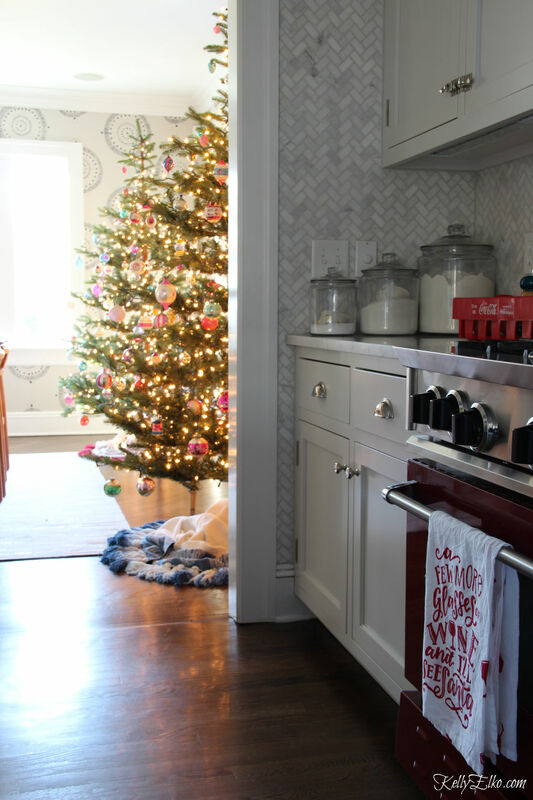 Your kitchen looks nice and cozy.I bet your boxed brownies are super yummy! LOL – I prefer eating the brownie batter to be honest!